Through the Buddhist teachings, I have come to understand the phrase, “suffering” as the raw vulnerability that arises when we are awakened to the simple truth that everything changes, including ourselves. We will inevitably die and pass on from this physical world as we now know it. This vulnerability is paired with the feeling of being connected to every other human being and conversely, a sense of loneliness, or aloneness. This year I left Burning Man with these same feelings magnified by a million percent. I am cracked open and vulnerable, filled with questions and truths about myself and life. I feel connected, grateful, raw, lonely, elated, inspired, deflated, sad, loved, overwhelmed, small and expanded all at the same time. My friend, just returning from his first experience on the Playa told me, “The things I’ve learned and experienced… I can’t go back to my old ways. I want to be and I will be present and aware. I am forever changed.” Black Rock City cracked him wide open to a world of love, connectivity, self and communal awareness, and a myriad of other inexpressible things. He is vulnerable and AWAKE! Driving back from the desert, my boyfriend expressed his discomfort with some of the flaws of Burning Man. Massive amounts of resources are used to support our lives out in the middle of nowhere. We amass endless numbers of disposable wipes, plastic blinky rings and glow sticks without a second thought. Good viable wood is used for projects and burnt to ashes at the end of the event. And this year, while Yosemite burned, firemen extinguished our organized contained fires. These are valid concerns, but I feel assured when someone returns from the Playa deeply touched and vowing to live by the core principles of Burning Man: Radical Inclusion, Gifting, Decommodification, Radical Self Reliance, Radical Self Expression, Civic Responsibility, Communal Effort, Leave No Trace, Participation and Immediacy. I can only hope that many of the 60,000 visitors feel that same way. Like the Buddhist teachings, self-practice, is how we begin to make change for the better, creating peace and global connection. So, yes, Facebook and Instagram are lighting up with images of the bright highs, late night dance parties, passion techno remixes and disco pyrotechnics. But, while these reflect the surface of Burning Man, perhaps they are the deeper vehicles for cracking us open, knocking us down into the fine alkaline dust, exposing our hearts and opening our minds, so that we re-enter our societies more awake, more grateful and more alive than when we left. 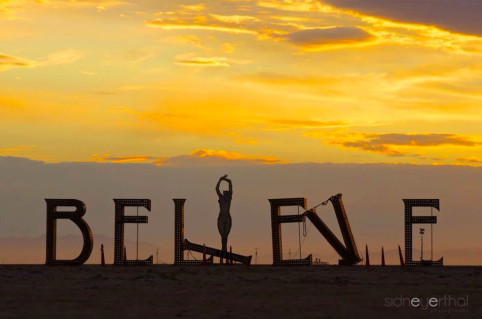 Thank you Barb- this is the first insight I’ve had into the spiritual side of Burning Man and a picture that paints it beyond the indulgent party that I’ve heard about. I really appreciate you sharing this!